What’s in store for The Orville? Recently, creator and star Seth MacFarlane discussed the future of the FOX TV show, TVGuide reports. The comedic drama is set 300 years in the future and follows the adventures of the Orville, a not-so-top-of-the-line exploratory ship in Earth’s interstellar fleet. The cast includes MacFarlane, Halston Sage, Patrick Cox, Scott Grimes, Adrianne Palicki, Chad L. Coleman, and Larry Joe Campbell. However, more episodes means fans might have to wait longer for season two of the FOX series. In fact, MacFarlane said the new season will probably not be ready in time for next fall. What do you think? Are you a fan of The Orville? Will you watch season two? 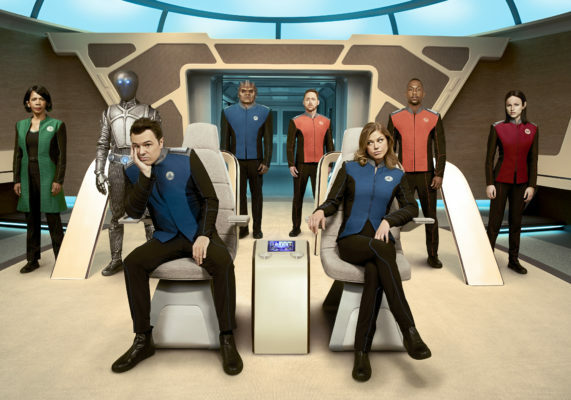 More about: FOX TV shows: canceled or renewed?, The Orville, The Orville: canceled or renewed? I think the show was great- very entertaining. Please bring it back for a second season. We really enjoy the Orville and its slightly twisted or tongue in cheek humor. I enjoy The Orville, and dont want to see it cancelled! We love the Orville! Funny, clever. Sometimes off the rails. This is soo much better than the latest depressing Star Trek (Discovery) incarnation. I am an avid fan of the original Star Trek and as lesser fan for the ST sequels. I think Orville is better than any sequel because it’s different, more humorous than technology stories. I look so forward to season two. I live in the UK and am a senior citizen. Just watched series 1…. I cannot wait until series 2. I know it is very “tongue in cheek” but this is my favourite TV show at the moment. It is full of good humour, it makes me laugh out loud. Not many tv series can do that. The characters are great……Seth …….PLEASE PLEASE do some more series. This is a brilliant show…you should be proud of yourself. I love this show. It is light and funny. It always has a moral to the story. My husband and I love the show. It has humour, sadness and drama! We can’t wait for it to start again.